There are times when it just feels like a movie or a book; reality takes on the nature of popular fiction. Yesterday time and rhythm were sort of reinvented. I’m not a person who naturally sits and waits quietly; I’m almost always multitasking. But the last 24 hours I have tended to focus deeply on the one thing in front of me. Yesterday it was watching Pablo. Shortly before Rachel left for work around 2, I realized that Pablo had been on his feet for hours, slowly walking from room to room, panting heavily. 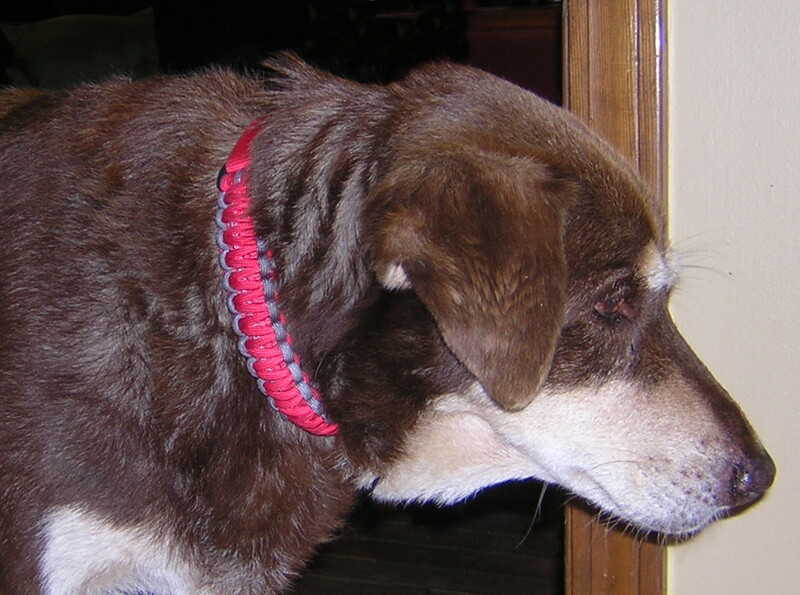 When he lies down, the pressure against his diaphragm is too great, so it’s easier for him to breathe standing up. He’d lost his breakfast along with the medicine Rachel gave him. He’d had no water, or very little. I went into the living room and sat on the sofa, not far from where he was standing in the middle of the rug. Speaking to him quietly, and sometimes silently, I encouraged him to lie down. The longer he stood, the harder I cried. About the time I began to calm down, he sat and then lay down in his familiar sentry position. He reminded me of Rachel as a baby, just simply not willing to give it up and go to sleep. 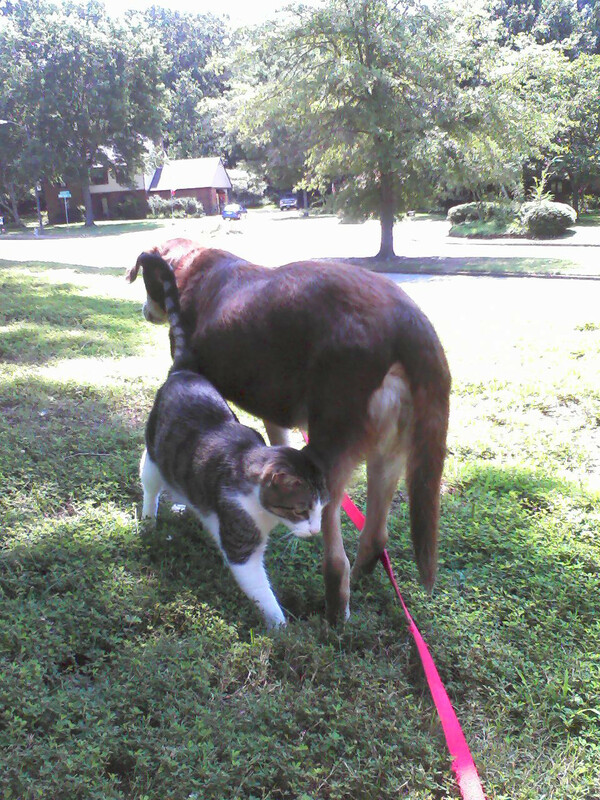 His head would loll nearly to his front legs, and then bob up again. He was on the job as best he could be, listening for intruders or the sound of his people moving about the house. Not long after Rachel left, I thought it might be a good idea for Elijah to come by after school. He wasn’t due home for another 24 hours and that might be too late. I sent her a text. She called me and we had a brief conversation. Perhaps it was hearing her voice on my phone; perhaps it was the mention of Elijah’s name; perhaps it was coincidence, but Pablo rallied brightly and went to the front door. I walked out front with him and he looked to the street and then the driveway. He was clearly on alert, for what I could not tell. We walked back into the house, and with a burst of energy, he scrambled up the stairs and went from room to room, looking for either Rachel or Elijah. I sat down on the top stair and waited for him to give up the search. Between us, Rachel and I had managed to get him to take a half-pill of Lasix every 30 minutes or so by crushing it, folding it into peanut butter and wrapping it in a strip of turkey breast. But he had so little appetite that he would only accept the one small bite and refuse to eat more. When Christian arrived with Elijah, we were still at the top of the stairs. I had placed a small fan on the floor on the landing, so he could stand in front of it. I know when I’ve had breathing problems in the past, that always seemed to help. It seemed to help him, too. The four of us went into my room. Elijah sat on the bed with me and Christian sat in The Chair. They asked questions and I answered them. Elijah offered suggestions and we tried some of them. Others, like encouraging him to eat kibble, I discouraged, explaining that I didn’t think he’d keep it down. I showed Elijah how to make a pill pocket and gave him an extra bite of turkey just in case. I could feel Elijah’s bitter sadness when he handed me the food that Pablo had refused. Elijah was able to get him to drink some water. We had a bowl stationed every few feet throughout the house. When it came time for them to leave, I walked Christian and Elijah downstairs. Pablo stood at the top landing, sides heaving, looking down. The two of them begged him to come down and I gently explained that he was too weak, that he’d surely come if he could. Elijah pressed his face against his dad’s shirt and they stood together for a long moment. I told Elijah he would see Pablo tomorrow. At that moment, I felt that he would. Pablo had not been downstairs for several hours and between the water and the diuretic I felt certain he needed a trip outside. So I began to persuade him down the stairs. But he could not manage the first step. And I began to cry. I pulled the rugs off the bathroom floor and told him that it was perfectly OK for him to pee on the tile. But I knew that he would not. Always when he was ill and had an accident in the house he was so ashamed. And I knew he would hold it a long, long time. So I managed to get my arms around him and together we scooted down the stairs on our butts, one step at a time, resting every few treads for him to get his breath. When we landed he was so exhausted he could not stand. Minutes went by and I watched and waited. I opened the door a bit so Vincent could come in and Pablo could feel the fresh air. Vincent is a tuxedo tabby and an entity unto herself. She and Pablo are great companions and are so sweet together. I guess we sat on the floor for 10 minutes or so. Rachel had taken up the area rug because Pablo had vomited on it that morning. So the floor was bare and he could not gain purchase enough to stand. I tried supporting his legs to no avail. Finally, he dragged himself to the living room using his front legs only, and was able to find enough traction to haul himself up. We stepped outside and he finally relieved himself of minuscule amounts of urine and waste. I had met my afternoon deadline at work and headed out to the grocery. I returned home with bags of fruit for the humans as well as a big tray of ground beef. I began every 30 minutes or so crawling up to Pablo on my hands and knees to offer him raw meatballs. He accepted one and two at a time, and by evening he seemed stronger. When Rachel arrived home, the rather flat and monochromatic scene became multidimensional and vibrant. I’d parked myself for the night on one sofa; she made her nest on the other sofa. She tuned into Netflix and booted up “Breaking Bad.” She’s only started watching it and is in about season 3. I’d brought Hannah in and fed her and tucked her into her crate. Hannah is a basset-dachshund mix not quite 2 years old. She is dynamite covered in fur and still trying to figure out how to sit quietly with humans. She’d fussed at me all evening, but when she saw Rachel ministering to Pablo she wailed miserably. Rachel put her back outside and from time to time Hannah would hurl herself against the door in protest. In between scenes of meth lab mayhem on Rachel’s enormous TV, we took turns beckoning, cajoling, reassuring, pleading, soothing and sometimes feeding Pablo. Sometime in the wee hours Rachel dragged Hannah’s crate into the garage and incarcerated her there. Apparently some imaginary creature was trolling the back yard and Hannah was trying to alert the neighborhood. About 6 am I began checking email to see what assignments were available at work. Christian texted me to ask after Pablo. I made coffee and made a Lasix meatball, which I handed off to Rachel. We were both still fully clothed, so there was no need to get dressed. It’s Rachel’s “weekend.” She has today and tomorrow off from work. Elijah comes home this afternoon and is here until Saturday morning. I took my laptop back up to my room, brushed my teeth and settled in for my workday. The house is quiet now. It’s nearly noon. Everyone is napping while I type. I am grateful for that. 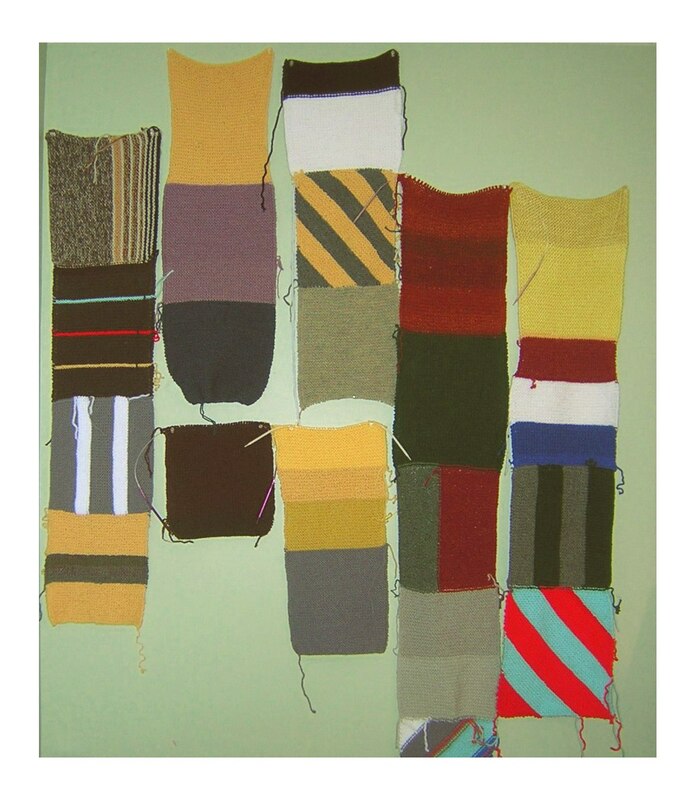 I made a small blanket for Elijah when he was about four, and it came out as a distorted parallelogram. If any of you use Photoshop, you know exactly what this looks like. 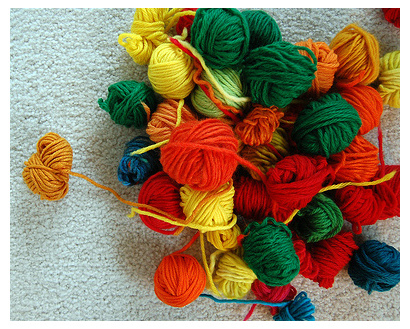 When I frogged it out it became a pile of small balls of worsted weight acrylic yarn, which I never use any more. Now I hardly ever go to movies. I think it’s because I watch them so much on my laptop that I get used to having a (mostly) purely cinematic experience. 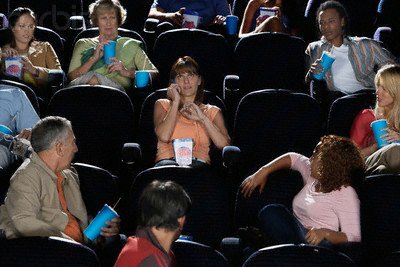 Watching a movie in any of our local theaters is sort of like seeing them at a bus stop. I just find it hard to tune out all the cell phones, the conversation in the seats behind me, the feet up on the seat next to me, etc., etc. So one weekend I decided to catch up with the rest of my family by watching ALL the Harry Potter movies back to back. By the time it was over I was sure I had been living at Hogwarts for two days. every boy needs a blanket. 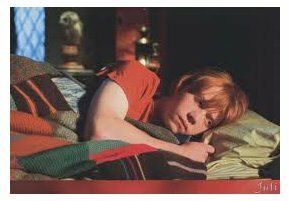 Then somehow when I was trolling my usual sites I came across a wonderful project by Jackie Wierzbicki— The Ron Weasley Blanket. You can read about her journey at http://penguineerspurls.blogspot.com/2011/12/potter-pattern-done.html. So I found yet another destash project, this time using those orphaned balls of worsted. 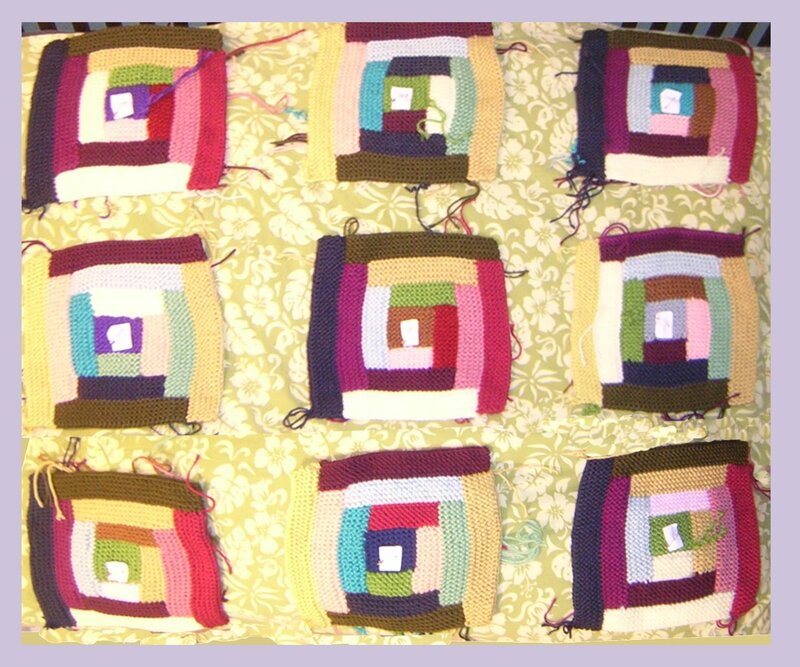 I’m averaging about three squares a week and hope to finish this by the time Eli needs a blanket on his bed. I ran out of stitch pins, so I substituted whatever circular needles were hanging around, just transferring the squares and letting the needle tips dangle on either side. I also had a hard time keeping up with where I was, since I didn’t QUITE have all the colors I needed in progress (Ravelry, Listia and eBay to the rescue, of course) so I stuck the squares up on the wall with pushpins. 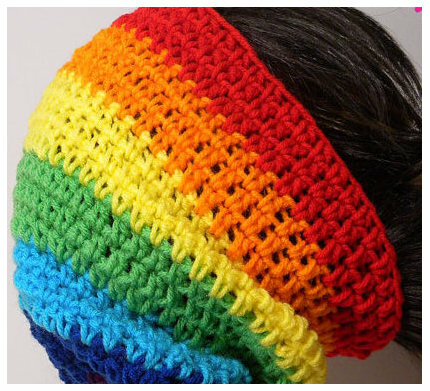 My daughter likes the look of this, so I told her for my next project I will knit her a wall. This was my first big destash project of 2012. It started on a long road trip from Memphis to Wichita, in the back seat of my daughter’s vehicle, next to Hannah, her puppy. I think it took on some of her characteristics. It required much more attention from me than I originally planned to give it. It caused me to spend more money than I had budgeted. And it seemed to take over my waking life. 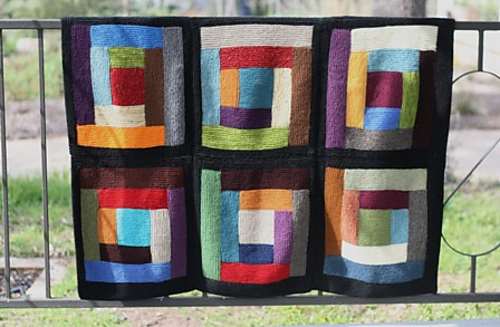 The pattern for the blanket shows it bordered with black, similar to many of the granny square afghans I grew up seeing. So I thought I’d border mine with a blue to match my dorm pillow. and the squares just kind of get lost. 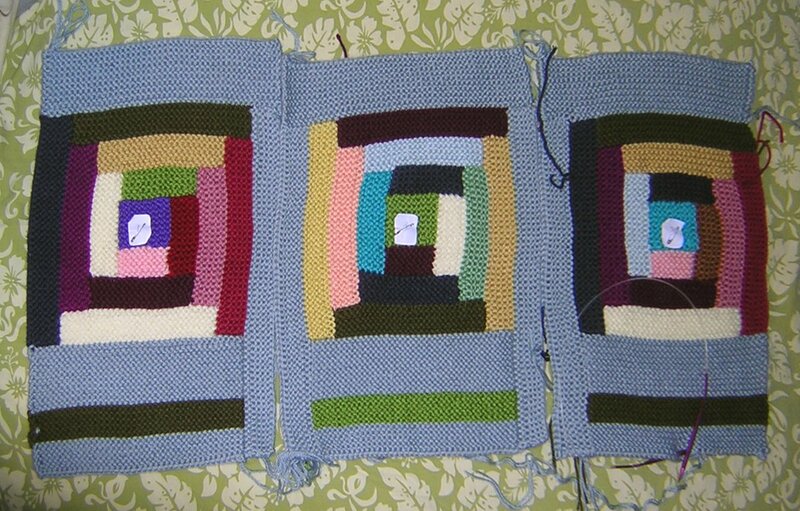 So I’m frogging out the blue and I’m going to make some more squares. Stay tuned.